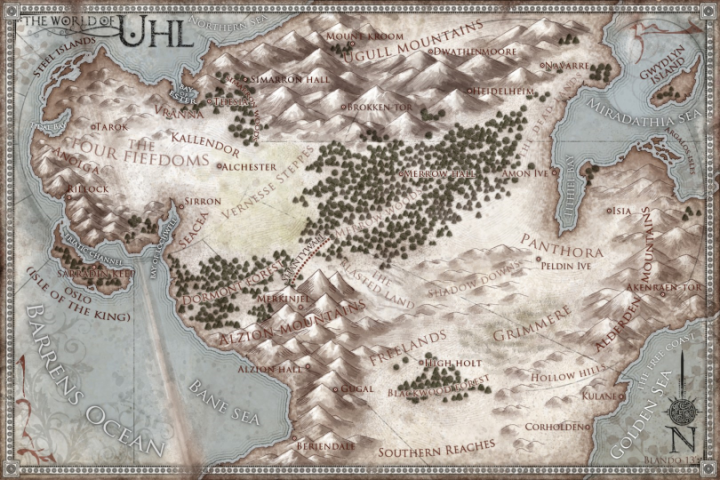 Without further ado, I give you, ladies and gentlemen, the world map of Uhl. The one thing that's immediately noticeable is how hard it is to read some of the names! That's why, if you click on the map, you'll be taken over to the World of Uhl web site where you can view a larger version. Even on that larger map it's a bit hard to pick out details. I think what I'll wind up doing is sectioning the map off into quadrants and putting those up. Alternatively, if money wasn't an issue, I'd have my mapmaker break out each kingdom and we'd drill down from there, highlighting each area in greater detail. But, there is that money thing, so that's probably not going to happen anytime soon. I realize these places don't mean much without their being some context or relation to my books. So, let's drilldown a little. In The Five Elements, I jump over to Seacea and the Dormont Forest. The shoreline and the forest are really the only points of context here. No Norwynne Keep, no Wildemoore Manor, no witch's house. 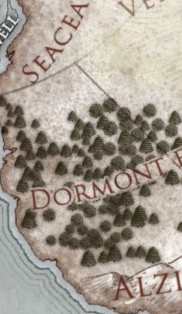 You'd have to jump over to the map of the Barony of Fallmere to see that level of detail. Therein is one of the problems: detail is nice, but it also clutters up the map. So, I tried to generally stay high level here. I think maps in fantasy books are important. That’s why I thought I was way past due on including some in my own books. Jared Blando of The Red Epic site is the illustrator I commissioned to produce my maps. He came highly recommended and I don’t think he disappointed. Below is the map to go along with The Five Elements. What do you think? Full descriptions of all locations and more can be found on the places page at the World of Uhl. I recently added a map to the front matter of The Hall of the Wood because I think maps are an important part of the fantasy reading experience. One of the first questions my illustrator, Jared Blando, asked me was if I wanted black & white or color images. Because I wanted to use the map on the World of Uhl site and because lots and lots of people now have color eReading devices, of course I said color. If needed, I can easily convert the image to black & white myself. I anticipated problems. Not with Jared or the maps themselves but with eBooks and the devices we read them on. Sure enough, after adding the map to the Kindle eBook version and viewing it on my Kindle 2, I saw right away that the map was next to useless. It’s simply impossible to read. Anyway, check these out and believe me when I say the map is unreadable. I guess this image isn’t the best (again, taking a picture of one of these devices ain’t so easy; lots of glare, for ex.) 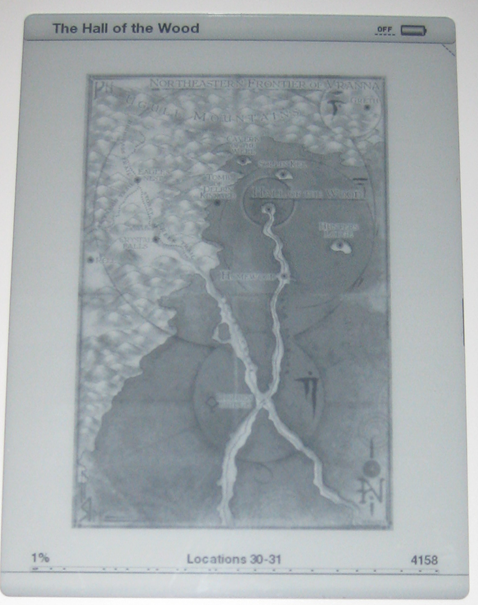 but the map is very viewable in all its glory. One of the best things about viewing it on the iPad? Pinch and zoom. You can zoom in, pan, zoom out, and swipe away. The higher res image really shines here when you get close up. Which is all fine and dandy if you own an iPad or similar device. But what about those who prefer traditional Kindles or other b/w eReaders? 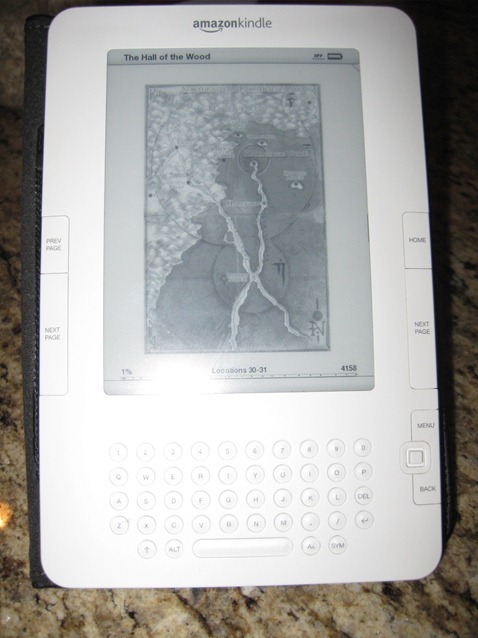 A friendly note from the author about maps: Maps, eBooks, and eReaders do not always mix well. If you have difficulty viewing this one or simply wish to see a larger version, I encourage you to open your favorite browser and visit the World of Uhl map section (www.worldofuhl.com/maps.html). While my primary motivation for including this extra option is to make things easier on my readers, I’m also trying to preemptively avoid any 1 or 2 star reviews because someone couldn’t read the map on their Kindle or nook. If you think that someone won’t do that, I have some primo beach front property to sell you here in Dallas. I think this is an adequate concession and hopefully accommodates everyone. Below is the map to go along with The Hall of the Wood. What do you think? 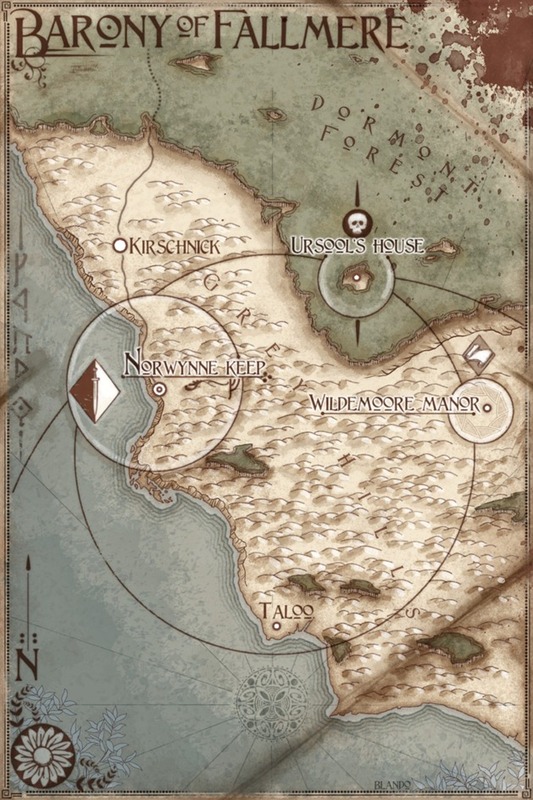 Maps in fantasy novels are as much of what attracted me to the genre as the fantastic elements and artwork did. I can still remember reading the Lord of the Rings, the Shannara books, and others and following along with the characters as they went about their quest. It was fun and even motivated me to keep reading late at night since I would often stick with the story until they reached the next outpost, tavern, city, or whatever it was the map indicated would be their next stop. The vibe over on Goodreads is that maps in fantasy novels are a good thing. The same goes for some people over on the Terry Brooks forum. Some won't even buy a fantasy book if it doesn't have a map. While it's not a deal-breaker for me when it comes to buying a fantasy novel, it certainly doesn't hurt the decision. If a map is professional as well as detailed, it's probably going to help, in fact. But just as a good map can bring a novel to life, a bad map can highlight an author’s shortsightedness, reinforce weak conceptual links between the stages of a plot, and direct reader attention to lazy writing and worldbuilding. Similar to a good quality book cover, a professionally done map is really the only way to go. I used to use Paint to work up gaming maps. They were fine for what I was using them for, but I'd never put such a thing in a novel for which I'm expecting people to pay money. If one considers a book cover the first thing a reader sees, then the map isn't far behind. A poorly done map can really turn off a reader and is perhaps an unfair sign of the quality of the writing. But a sign nonetheless. A good fantasy map lends authenticity to the world it depicts. It makes the story—and the characters—more real because one can more readily believe the fictitious world is real. Also, it signifies a higher level of professionalism on the part of the author. It shows that he or she cares about the product being delivered to readers. I have to watch out for this one as the next book in the Alchemancer series takes place all in one location even though I've got a map coming from my illustrator which will detail the surrounding area as well. On the plus side, I'm also having a map done of the city in which everything happens. Hopefully that will balance things out for anyone who shares the 'broken promise' opinion. While it would seem a lot of people consider maps important, I can't help but wonder how relevant they remain considering that quest novels and books that have a lot of "characters going places", where maps really shine, have fallen out of favor. I know GRRM's novels have maps, though, and I don't remember too many quests going on in those books. 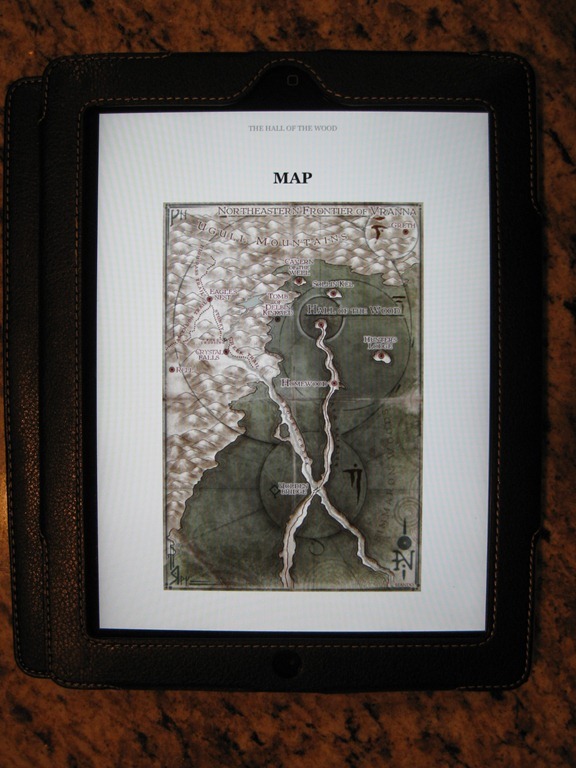 Another reason I wonder about maps in today's world of eBooks and eReaders is because it isn't easy to navigate back and forth between your current reading place and the map itself. At least not as easy as flipping pages in a paperback. I probably need to test this out on my iPad before I go on about this point too much, but I've not found it to be the greatest experience with my Kindle 2. But this is a problem technology can solve. It may have already. Which brings me to my next point, which is that with the proliferation of tablets maybe maps in glorious color and detail are more important and relevant then ever before. While black and white does just fine for maps, fantasy maps in particular look so much more vibrant and alive in color. Of course, with all of this talk of the importance of maps the astute reader will notice that I don't have any maps in my own eBooks. Not yet, anyway. I think they're important enough, though, that I commissioned an illustrator/cartographer to work some up. I've already revealed the map for The Hall of the Wood. Other maps to follow include a regional map for The Five Elements, a world map of Uhl (the world I set my novels in), and two for the next book in The Alchemancer series—one regional map and one of the city where most of the story takes place. What are your thoughts on maps? Good, bad, or indifferent? 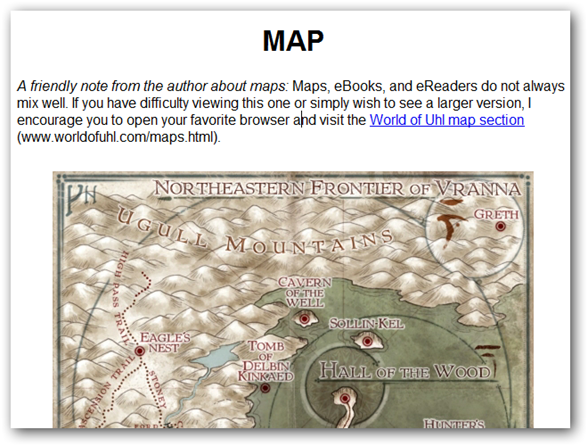 Do We Need Maps in Fantasy Books? MIND MELD: Which Fantasy Maps Are Your Favorites?